Phonthip Style Thai is one of many local spots to enjoy authentic Thai. Phonthip Tungkana long dreamed of coming to America. One day, she decided many years ago, she would open her own restaurant in the U.S. to share the complex flavors — combinations of sweet, spicy, salty, sour and bitter — and fresh ingredients of her native Thailand. She would cook from memory the recipes passed down from her mother, who learned to cook those same dishes from Tungkana's grandmother. 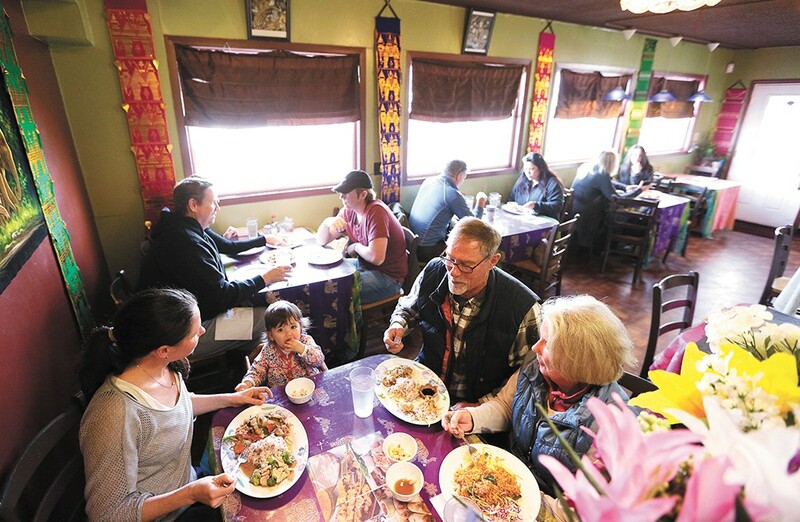 Finally, decades later, the Bangkok native's dream became reality with the opening of her tiny North Spokane restaurant, Phonthip Style Thai, in 2009. "I came to Spokane because I wanted to open a restaurant like I had in Thailand, for almost 30 years. It was very big," Tungkana recalls, continuing, "I first came [to the U.S.] with my daughter... and I told her 'I want to open a restaurant.' And she said, 'It's OK if you want to do that,' but she said, 'You just come here first. You don't understand about things in the U.S.'"
So while her daughter, June, was living in Virginia and attending school, Tungkana worked at a local Thai restaurant to learn the nuances of working in an American restaurant, albeit one that was cooking the cuisine she knows so well. When Tungkana was ready to set out on her own, June encouraged her mother to start out small so she could learn the U.S. tax system, learn to speak English and learn the challenges of running a business in an unfamiliar country. "'Try and learn first, and if you want to open a big one, you can open a big one. Start small,' Tungkana remembers June telling her. Phonthip Tungkana's dream was opening a Thai restaurant in America, and it's coming true in Spokane. Located in half of a small building that also houses a hair salon on the busy corner of Francis Avenue and Nevada Street, Tungkana's diminutive restaurant is calm on a Wednesday afternoon between lunch and dinner. Most of the 10 or so tables are empty. Traffic speeds by outside as she and her all-woman staff — her employees are also all Thai natives — prepare for the impending dinner rush. A few late lunchers stop by, taking their pick of seating: a man waits near the door for a takeout order, while a pair of older women take their time reading through the menu and ask their server numerous questions. The two women seem like newbies to Thai cuisine, just the type that Tungkana hopes to win over with her time-tested dishes, each made with care. While Tungkana's Pad Thai is by far one of her menu's top sellers, she proudly shares that customers also love her cashew chicken, drunken noodles, pad kee mao and Panang curry. The papaya salad (som tum), perhaps a lesser-known Thai staple, is also quite popular. When diners tell her they enjoy her food, Tungkana feels energized and empowered. "After I cook and customers say [the food] is the best in town, it makes me happy and proud. Hearing them say 'Thank you, Phonthip, it was very excellent, very good,' it makes me feel not tired," she explains. Unlike many Thai restaurants, Phonthip's menu is concise, consisting of just a few pages of items. With a small kitchen, she can't feature more than 100 dishes, as many other Asian-fare restaurants tend to do. This choice also allows her to showcase the dishes that Americans most enjoy, as well as those she's most proud of — all are made from scratch — like her family recipe for mango sticky rice. The traditional Thai dessert features a small portion of gelatinous, semi-sweet rice sprinkled with sesame seeds, fresh mango slices arranged around it. The tart and sweet fruit contrasts with the warm rice that's also drenched in coconut milk. Tungkana is so proud of this dish that she insists on driving to the Asian market down the road to go get a better ripened mango — the one in her pantry is not quite mature — so she can make some for us to try. Next to the bright-orange fruit, the rice is tinted a pale green, colored naturally using a herb leaf, Tungkana explains. 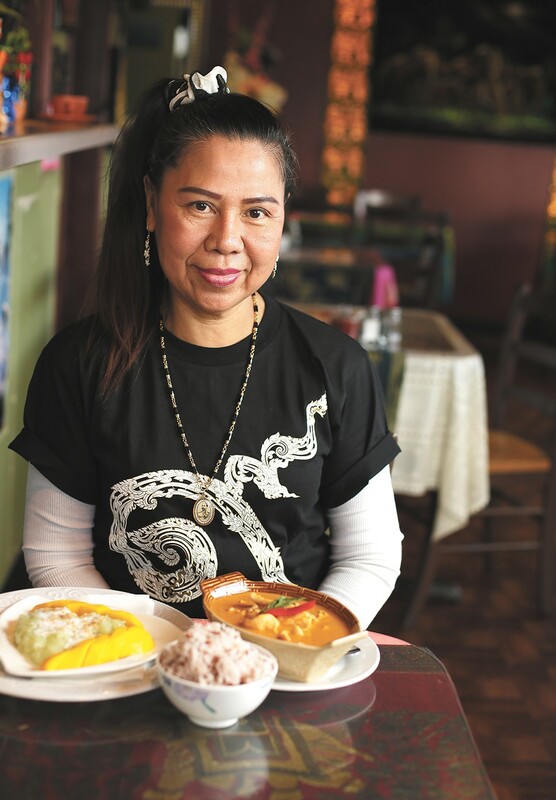 "I make better mango sticky rice than anyone in Seattle, Boston, Virginia — I think the Thai people who taste it would say, 'Mmm... this mango sticky rice is very good!'" she says, laughing. Since her restaurant has become many locals' go-to for Thai food in Spokane, Phonthip now dreams of expanding to a larger location in the area.